I bought a can of tomatoes and it was there in my pantry sitting for a long time. 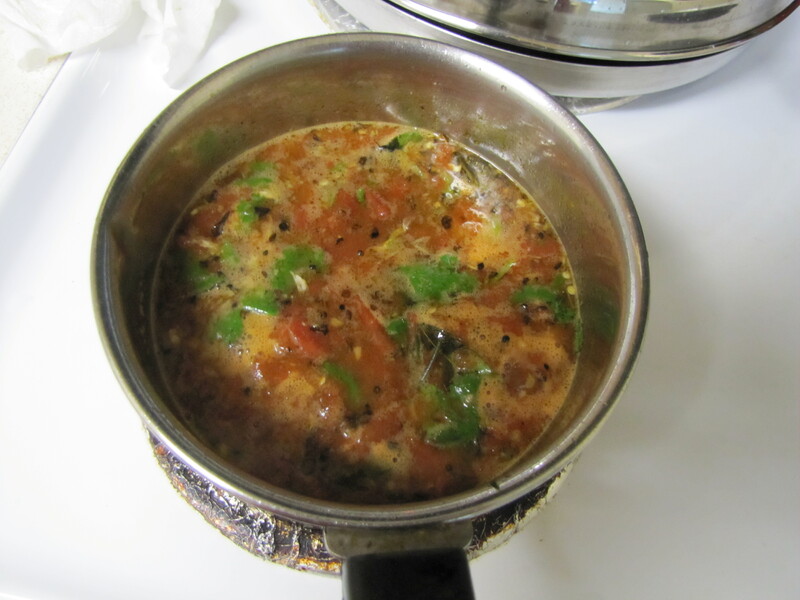 So i've decided to make rasam out of it,though i hubbie don't like it. My bro used to say rasam should be eaten after a heavy meal for digestion and not as a main meal..HAHA...He hates rasam. I still remember those good old days....But i'm a rasam lover. I love to the extent where i'll pour rasam in a tumbler and drink ... c, 2 extreme characters in a family..
Take a bowl and mash the tomatoes very well with ur hands having no big chunks left. Grind coarsely the items given inthe table without adding water. Mix this masala along with the tomato juice we've made earlier. Switch on the stove and let this mixture come to a boil. In the meanwhile,heat a small pan with 1 tsp of oil and do the seasoning with mustard seeds,cuury leaves &amp;hing .Pour this directly into the rasam mixture which is boiling. Let it boil for few more minutes and switch off. Garnish it with coriander leaves. thisis one of my hus fav n daily i makes for him...Urs luks really hot n spicy..